It is hard to believe that 2014 is almost over. This year has been a big one in the history of Urban Boatbuilders, and every month has brought exciting changes, good news, and record growth. With your help, Twin Cities youth have had amazing and life-changing experiences through our Apprenticeship Program and in schools throughout the Twin Cities. This very month, four Apprentices graduated from the program, and we were proud to send them on to even bigger and better things in their lives. But we also welcomed an even greater number of brand-new Apprentices into the program, every one of them excited to learn and to put on their Urban Boatbuilders apron three days a week. Andrew and Mathias, Apprentices of long-standing who have matured into leaders and skilled craftsmen during their time here, have become Urban Boatbuilders’ first Youth Instructors, and will be in the shop helping to teach younger Apprentices the art of boatbuilding. To see young people grow in confidence and talent and then turn around and pass their experiences on is immeasurably rewarding for me and for all of our staff. Your support makes these successes possible. The holidays are a time for celebrating all the wonderful things that happened that year, but they are also a time to dream big and look forward to an exciting new year. With new Apprentices working in a new workshop, new faces joining old friends, and more potential than ever, Urban Boatbuilders will continue making a difference by giving youth the tools they need to build their lives. With your help, 2015 is going to be a great year. Come see our new shop on February 8th! We will be celebrating our friends and supporters at our Grand Opening, and you’re invited! Let us thank you in person for all that you do. Last week, Urban Boatbuilders celebrated the graduation of four Apprentices. Zane, Nathan, Mathias and Andrew have all been part of the Apprenticeship Program for more than six months, and Wednesday evening was spent celebrating their achievements and presenting them with their graduation certificates. Each Wednesday, Apprentices from both crews are present in the workshop, and so the new Apprentices were all there to watch the ceremony and see the experienced Apprentices complete the program. Instructors Phil, Angela and Michael spoke about their experiences teaching each of the four. Then the graduating Apprentices themselves came forward and offered their own comments about their peers. All of the speeches were positive and heart-felt, and the Apprentices’ friendship was obvious. The audience heard about Zane’s care and attention to detail, Nathan’s boundless energy, Mathias’ hard work and cool shirts, and Andrew’s enthusiasm for trying new things. With staff, volunteers, and Apprentices together, the graduation ceremony was a great way to recognize the accomplishments of the four graduates. Furthermore, it showed the new Apprentices what they can look forward to as they stay involved at Urban Boatbuilders. At Urban Boatbuilders, we all work to provide young people with experiences and learning opportunities that will help them grow into confident young adults. Having our Apprentices graduate from the program and talk about each other’s successes and contributions in front of everyone shows the value of that work in action. With Mathias and Andrew staying in the program as Youth Instructors to help teach new Apprentices the ropes, and with Zane and Nathan moving on to new jobs, Urban Boatbuilders has clearly played a powerful, positive role in their lives. I heard my parents briefly discussing a youth organization in which they build canoes. I thought it sounded cool, so I followed up, came in for an interview and applied, and now I’m here. I already knew some of the people here, it’s not too far away, and I like the kind of work they do. It’s not easy, but it’s not hard. They teach you and you learn some skills. I like general wood-working and making things. I was hoping to advance my carpentry skills because I have very limited knowledge about wood, tools, or anything of that sort. I also liked the boat part of it. I’ve gone out on trips in the canoes, and they feel solid. 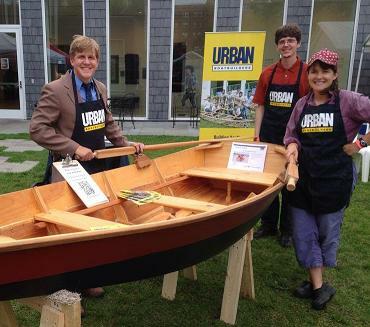 I’ve been to the Boundary Waters before, but I think it would be fun to go with people from Urban Boatbuilders. How to make things with wood. It’s good to know basic woodworking skills like how to put in a door frame, so that way you don’t have to call an expert and you can do it yourself. I’ve enhanced my fine motor skills. And I guess being able to interact with people has been improved by being at Urban Boatbuilders. I wish the shifts were longer, so you had more time to really improve your skills. I personally want to go into international business or commercial aviation. International business is either an American or Asian shipping company, and there is a large array of things they do. They could even ship aircraft landing gear. I’m also interested in commercial aviation, and I’ve been in the cockpit of a Boeing 737 at 30 thousand feet. I’m proud that I have always been on time and that I made a toolbox that my family uses now. The pencil. Because you can draw stuff and you can write things, and you can get your thoughts across visually without actually speaking. I have been on the deck of a Nimitz class aircraft carrier, which has two nuclear reactors with around 500 thousand horsepower. It doesn’t have to refuel for about 4 years. On December 4th, the Saint Paul Riverfront Corporation and the Mississippi River Fund recognized Urban Boatbuilders as a 2014 River Steward Honoree. The award is meant to recognize individuals and organizations that are committing time and talent to improve the health and vitality of the Mississippi River. Urban Boatbuilders is committed to sharing the importance of the Mississippi River to our communities with Twin Cities youth, and every year we engage young people in activities on the water. By educating urban young people who might not otherwise get to experience Minnesota’s natural spaces and the Mississippi River itself out on the water, we are helping to nurture broader awareness of the importance of protecting and valuing the Mississippi. Our rivers and lakes play an essential part in the lives of Minnesotans, and that connection informed the creation of Urban Boatbuilders. We are honored to have been recognized by the Saint Paul Riverfront Corporation and the Mississippi River Fund alongside Peter Gove and Shanai Matteson and Colin Kloecker, who won the Emerging Leader Award. As our Executive Director Marc Hosmer says, “We are thrilled to be recognized as the 2014 River Steward organization. There are so many great people and organizations that work incredibly hard to make the Mississippi and wonderful asset to our neighbors and communities and we are glad to be a part of this important work." Please join us on December 30th at the Radisson Blu for the Hats & Mittens Winter Ball in support of Urban Boatbuilders! You can reserve your seat here! Hats & Mittens was founded in 1996 with a mission to provide Twin Cities children with good winter weather clothing and to raise money to support other organizations that are serving children. Their mission statement: Friends gathering to celebrate the season and help children in need. In recent years, Hats & Mittens has sponsored organizations like Cookie Cart, Read Indeed, and Children's Grief Center, benefiting these important organizations and the children they work to help. Furthermore, the many hat and mittens sets that are donated through Hats & Mittens are invaluable in keeping young people warm in our cold winters. For 2014, Hats & Mittens has set a goal of providing 50,000 mittens and hats to the children who need them. Urban Boatbuilders is very excited to be partnering with this great organization to do good for youth this winter! The Annual Winter Ball will feature music, great food, a live auction, and dancing, and is sure to be a delightful occasion to join give to our community and help Urban Boatbuilders keep on providing Twin Cities Youth with the highest quality learning opportunities. Meet Our AmeriCorps VISTA Sam! Last month we introduced Urban Boatbuilders' AmeriCorps VISTA Harry. Recently, Urban Boatbuilders' second VISTA, Sam, sat down to talk about his role. 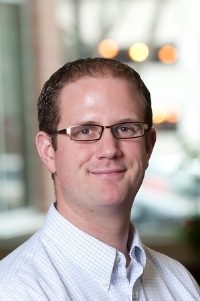 My name is Sam Hartzell, and my VISTA position at Urban Boatbuilders is the Development and Communications Specialist. Long story: I'm from Pennsylvania, but I was in Minneapolis last winter for an internship. While I was in town for that, I learned about Saint Paul's VISTA program through the grapevine and ended up applying. I saw Urban Boatbuilders in the list of organizations hosting VISTAs, and I instantly knew that was where I wanted to do my service. I studied international relations at Goucher College in Maryland, which means I can talk to you about Nuclear Deterrence Theory, and I also studied philosophy, which means I can talk to you about Truth. I spent most of my college experience participating in volunteer programs and I did a lot of tutoring and mentoring with students from the public schools. That experience made a big impression on me, and really hammered home how powerful it can be for young people to have someone older but still relatable be there to inspire them. All my favorite teachers in my life were people who really got to know me and who really cared. Urban Boatbuilders makes that difference in young people's lives, and that's wonderful. Everyone is so welcoming and helpful, and the first months here were a whirlwind of learning the ropes. I got a ton of help when we started, and now I work really closely with the Executive Director and my fellow VISTA Harry. It's a great team, and it's an exciting mix of independence and having to depend on each other. There's always something going on. One of my roles is to be the mastermind for our Waterlines newsletters. I get to curate all the entries and put everyone's writing together into the final piece, and we've brought together some really interesting Waterlines these last few months. It's really fun getting the chance to learn about all the different facets of Urban Boatbuilders' work, talk to different people involved, and share it all with Urban Boatbuilders' friends and supporters every month. I want the next wave of VISTAs to be able to come into the office on their first day, once I and Harry finish our service, and have there be a really, really strong foundation for them to carry on the work of helping Marc, Angela, Phil, and Michael and everyone else make Urban Boatbuilders the best it can be. That's what I'm here for. Our predecessor VISTA Sara Kay provided just that for us, so I want to live up to that. I can recite most of the poem The Charge of the Light Brigade from memory and I make a mean, by which I mean delicious, blueberry pie. Usually not at the same time. With Urban Boatbuilders settling into a new home and the Apprenticeship Program starting up with two new crews of Apprentices, our boatbuilding instructors Angela, Phil, and Michael have a lot going on. They recently took a moment from their busy schedules to talk about how the Apprenticeship Program is progressing. Urban Boatbuilders recently moved to a much larger workshop and has welcomed many new Apprentices to the program. That’s a big transition! How is it going, overall? Michael: Overall, it is going very well. We’ve expanded our programming to serve six new Apprentices. That has been accomplished by having a larger workshop, and has allowed Apprentices to work with an adequate amount of space. We’re nearing the end of our tool storage solutions, meaning that all of the tools have homes. Angela: It’s really exciting to have the space bustling. And to have new faces and new energy. And it’s also really exciting that Apprentices who have been in the program for a while are now getting more opportunities to teach. So it’s been rewarding getting to see that transition. Has the extra workshop space changed how you teach? Is there anything it has made possible that wasn’t possible in the old shop? Phil: It’s hard to narrow that question down because there is more than just the space that has effected how our program is delivered. We’ve made a lot of changes to the program that have been implemented by Michael and Angela. Being in a new space certainly made it possible to implement those changes successfully. Angela: Having the new space gives us room for everything from get to know you games to building three boats at a time. That would happen before, but with lots of bumping into each other and constant rearranging and tiptoeing. Now everyone can comfortably work on any given boat in a much more peaceful setting. Phil: There is no chance that we could run what we’re running in our old space. It would have been crowded and uncomfortable and impossible to do the range and volume of activities that we’re doing now. One thing I’ve noticed specifically is that our tool and fastener organization allows our Apprentices to operate more autonomously because it’s self evident where the chisels go. We’re able to maintain a higher standard of shop organization and cleanliness. Angela: Also, it’s awesome having a kitchen where apprentices can grab a snack. We didn’t have that before. Are there any challenges that come with working in a larger workshop? Michael: Yes, and they’re not the ones that I thought we’d have. I thought the Apprentices would be harder to supervise in a larger workshop, but they tend to gravitate to certain tasks and work with each other. The challenges are mostly locating tools that were packed and moved from the old workshop and setting up vices and clamps to hold the projects the Apprentices are working on. Angela: I find that things get lost more easily. And you need more eyes be sure that everyone is engaged and comfortable with what they’re doing. We can always use more dedicated volunteers to help out with that. But otherwise it’s going great. How have the new Apprentices taken to the program? Are there any stories that stand out from their first weeks that you would like to share? Michael: Yeah! We played an awesome ice-breaker on the first Wednesday all the Apprentices were here called the curtain game. It was a memory name game. That was really fun seeing how quickly everyone could remember each other’s names. We’ve also started the Apprentices on their personal projects, which are their paddles and toolboxes. It’s really awesome to see how fast they progress. Overall, everything’s great. We recently graduated four Apprentices, so I thought it was neat for our new Apprentices to see the Apprenticeship come full circle. It gives them something to strive for. Angela: I can speak about my crew of Apprentices. We have three new Apprentices that we’ve hired on and it’s been great watching them learn new skills and get acclimated to the program. One of them in particular has a lot of talent and promise in part because he used to work for a business that did tree servicing and removal, so he has experience felling trees, using a chainsaw, and working with trees before they get turned into lumber. His perspective is unique because he gets the connection of the full process of wood-working. He has an incredible curiosity and appreciation for the type of skills that he’s gaining here. Has he been able to share that experience with the other Apprentices? Angela: He does in little tidbits here and there, but I would love to have him share his knowledge and experience to the rest of the group because it’s really valuable. It’s hard sometimes to understand the connection to the material resource of the trees. The Apprenticeship Program serves more Apprentices now than ever before. How have you adjusted to the larger number of Apprentices? Phil: One big adaptation that I think is already proving its worth is having youth instructors. These are experienced Apprentices who are almost miniature versions of us. They help delegate responsibility and assist new Apprentices in learning tasks. And as we used to, we still rely on the presence and guidance of caring volunteer instructors. It’s worth noting that we have more integrated safety elements that make it less stressful to manage a larger number of Apprentices. Angela: It’s been great having Michael onboard, because now we are both able to split the administrative work between the two of us and Phil is able to focus more deeply on the building process and planning of the boats. Splitting up those responsibilities has let us tackle the growth of the program more effectively. Another major change is in the way that we do outreach and hiring. Having a two-week training period for the Apprentices has been useful as a tool for letting potential applicants figure out if the Apprenticeship Program is the right fit for them. The opportunity to try it out has been helpful in finding youth who are particularly excited by woodworking and the tools that we use here. Is there anything you can do now in the program now that you couldn’t when it was smaller? Phil: Yeah, I think there’s a general sense that the Apprentices feel like they’re part of a bigger crew, and they seem happy about that. That’s my assessment so far, that we have more of a youth-driven culture. That’s what we’re trying to provide, so that the Apprentice feel welcome and at home. What are the Apprentices working on now? Angela: They’re working on building the Wee-Lassie, a single person canoe, and just finished steam-bending the ribs on a skin-on-frame wilderness traveler canoe. Some of them are doing special projects connected to tool-storage for the shop. And others are working on personal projects building their own paddles and tool-boxes. Two experienced Apprentices are now Youth Instructors. How does their presence help your work? Michael: They provide an additional set of eyes, ears and overall experience and talent in boatbuilding and craftsmanship. Some of their duties are to be instructors like myself and Angela. They help trouble-shooting projects, lead break times and clean up duties, and help with setting up the shop at the beginning of the day. Angela: On my crew with Andrew as the Youth Instructor, it’s invaluable having his help. He not only helps train apprentices on how to use different tools, he also helps make everyone feel comfortable and connected to the group. He has great emotional intelligence, so he helps be the social glue that helps folks form bonds. It’s been great having him lead games and get-to-know-you activities. Phil: I’d like to see a gradient of boatbuilding projects. So some that are easier, and some that are more difficult. I’d like to see youth working their way into difficult builds. There should be more opportunities for Apprentices to stay longer than six months. We already have one, with the Youth Instructors, but I’d like there to be more. Michael: I hope we can expand programming to serve 18 to 20 youth. Given that we have this new workshop I think that’s a realistic goal. I hope to expand our school partnerships and serve the communities we’re in. And I hope to keep track of and stay in touch with the Apprentices we've graduated. Angela: The move to the new workshop has kept us all really busy, but I want to have more youth led workshops in the future. I’m excited to develop the Youth Instructor program and get the program to include as many leadership opportunities for youth as possible. I want to develop more education workshops connected to STEM fields, social justice, financial literacy -- workshops and educational opportunities peppered throughout the program. So that we can be more intentional about teaching a wide variety of topics. Hats & Mittens will be hosting their annual gala, to be held at the Radisson Blu at the Mall of America on December 30th, for the benefit of Urban Boatbuilders! The evening will include live music, dancing, excellent food, and a silent auction. Tickets are $85 per person plus a child’s hat and mittens set. This is a great way to support Urban Boatbuilders, help provide children with warm clothing, and meet like-minded people. Join us at this great holiday event. Black tie admired, but not required! With Urban Boatbuilders settled into the new workshop and our programs going into full swing, we want to take a moment to thank everyone who helped make all this possible! Please join us for our official Grand Opening Celebration on February 8th, take a tour of the new workshop, and let us provide the festivity, food, and fun! Urban Boatbuilders' work is possible because of your support, and we want to thank you in person and recognize your contribution. We hope to see you there!